Irish carrier CityJet has become the first operator to receive residual value guarantes for Russian Sukhoi Superjet 100 (SSJ100) regional airliners. A total of 1.2 billion rubles ($20 million at the current exchange rate) was allocated in 2015 to cover the six Superjets currently in operation with the carrier, Vedomosti daily reports. The funds were deposited into the registered capital of the United Aircraft Corporation (UAC), the parent of SSJ100 OEM Sukhoi Civil Aircraft (SCAC). The sum was later transferred to the corporation’s subsidiary UAC Capital, which was founed in the summer of 2015 to support the SSJ100 and Irkut MC-21 programs. In 2016, the residual value guarantee line received further 1.05 billion rubles from the federal budget (against the initially planned 3.5 million). UAC Capital has directed the funds towards creating a residual value guarantee reserve for five SSJ100s to be delivered in 2017 (the customer is not being disclosed). The allocation schedule for the next three years implies 676 million rubles in 2018, 1.6 billion in 2018, and 2.4 billion in 2019. The total duration of the program is 12 years. The residual value guarantee program was designed to provide aircraft owners with a set sum when they decide to sell the airplanes should their residual market value be be lower than that forecast. Seeing as the SSJ100 program in very young and has not yet generated that many aircraft for the secondary market, no data has been accumulated so far that would help predict the jetliner’s residual value dynamics. The guarantee program was originally expected to launch in 2015 in testing mode, and to reach full scale one year later. It primarily targets those lessors which lease out their aircraft for between six and 12 years, and covers the first 100 aircraft produced. In January 2015, UAC President Yury Slyusar said the residual guarantee program was to last until 2025. He added that beyond 2016, the amounts of allocations would depend on how many SSJ100 sales there would be. Vedomosti reports that the SSJ1100’s residual value has ben lowered from the initial 60% to 40%, of which 26% is guaranteed by the OEM and the remaining 14% by the federal budget. 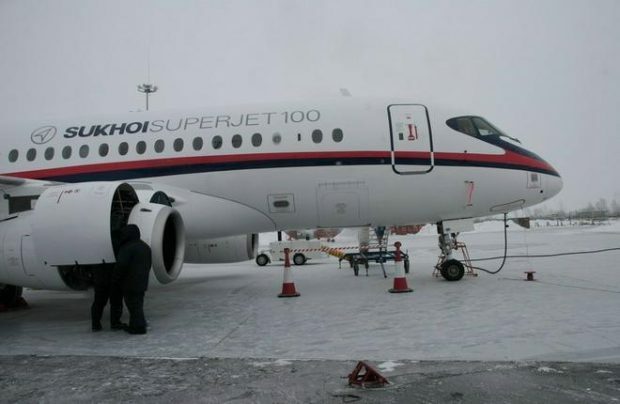 A source quoted by the publication said that up to $1.2 billion might be required to buy out the remaining 40% of the 100 SSJ100s covered by the program (the aircraft’s catalog price stood at approximately $30 million in 2016). In fact, the program’s budget is subject to change depending on how much money the partners command. “The sales support guarantees, and other mechanisms that we are elaborating jointly with [Russian government-run bank] VEB, are intended primarily for the export aircraft,” UAC explains. Mexico’s Interjet may also be eligible, and has indeed applied. The OEM says it will consider offering the benefits as part of future deliveries to the Mexican carrier. As one of the launch customers Interjet received its aircraft at a discount. For deliveries to Russian operators, other support mechanisms have been introduced. These include additional capitalization of the State Transport Leasing Company (abbreviated to GTLK in Russian) and providing the lessor with syndicated loans. SSJ100 rivals also come with residual value guarantee. Embraer offers a 40% guarantee for its E190 and 45% for the Е190 E2. Bombardier’s program covers 27% of the initial price for the CRJ900/1000 airliners.